One caveat is that this doesn’t refer to my business at all. Ask any of my clients, I execute! It only applies to things pertaining to me. Last week, I took a look at the domains I own, and I realized that if I had executed on some of the ideas, I would probably have an amazing business from at least one of them. Nearly 10 years ago, when I was living in Portland, Oregon my girlfriends and I always went to happy hour. One night, we had the idea to create a happy hour review blog. No one was doing it. Had we executed on it, we probably could have started with a happy hour focus and then moved into other lifestyle categories. Around the same time, I was working a client in the architecture industry and I had the idea to buy the domain stylemodern.com. I thought it was an awesome keyword combination but also thought I would make a blog about interior design, decor, and lifestyle. My problem? I found design sponge and my inspiration was deflated by the thought, “someone else has done it”. When the iPhone first came out, one of the first things I remember doing was scanning each of my airline reward cards and putting them into a special photo album on my phone. Why on Earth didn’t I realize the opportunity to turn that into an app?! No one had done it yet and now there are so many apps for managing rewards cards! Last year I had an idea for a very unique niche of designer temporary tattoos that I pitched to Tina Roth Eisenberg (aka @SwissMiss), the founder of Tattly. She wrote me back saying she loved the idea but that they were already in talks to launch a line of tattoos in that niche with a major brand. I waited months to propose this idea to Tina! I wonder if things would have been different if I had executed earlier?! Those are only a few examples! Yesterday for some reason, the book Execute popped into my head so started reading it and finished it in a few hours. Thankfully, it made me feel like I wasn’t a huge slacker for not executing on all the ideas I’ve had in the past. 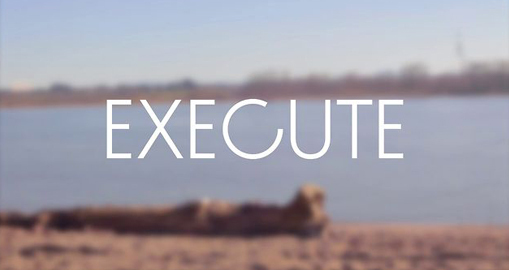 Execute is a collaboration between Drew Wilson (on Twitter @drewwilson) and Josh Long (on Twitter @joshlong). Drew is a hybrid developer and designer who built an app in 5 days without going insane or burning out. Josh is a designer and writer who wanted to write a book not about process and methodology, but simply how to move from inspiration to action — how to execute. To make sure the book truly focused on execution, Drew and Josh wrote the book in 8 days start to finish. The book is very well written and is a combination of ideas but also practical short stories on how Drew built an app in 5 days. Some of the ideas seem pretty obvious, but I’d argue that sometimes the most obvious changes are the hardest to make! The biggest lesson I learned was that I need to spend less time collecting ideas and inspiration and more time executing. One of my big problems was that I found I had so many ideas and inspirations that I wouldn’t know which one to pursue. So naturally, I’d try and find a way to weave them all together and next thing I knew I was overwhelmed and wouldn’t do anything! As soon as I read this I highlighted it and made a note that said “THIS IS ME”. Before I read the book, I had planned on being more intentional about executing this year. I wanted more little wins, more feelings of accomplishment and finality. For example, I’ve started a weekly newsletter called Sarah’s UX Notebook that I send each Friday. It feels great to actually have done this (ok, it’s only week 2 of the year … but still!!!). You can sign up for my newsletter here. I have a few little very simple and low fidelity / low tech strategies I’m using to try and keep myself on track. I plan to write more about them in the coming months when they’ve proven effective (I hope!!!). In the meantime, check out Drew and Josh’s book Execute which comes in hard cover from Amazon or an ebook from the book website www.executebook.com.